This was not what I was expecting. I’m not sure what I was expecting, but it wasn’t this. I think, after having read Vampires in the Lemon Grove, I was thinking this would be more supernatural. And there’s definitely an element of it in this book. If you’re expecting there to be a nice neat happy ending to this story you will be disappointed. At first, I thought that Ava would be the one who would come up with a plan to save Swamplandia!. And then, it seemed like Kiwi would unearth something at World of Darkness that would bring it down. Neither of those things happen. What does happen is a strange journey into a dark place for the Bigtree children. For Ossie it’s a descent into a kind of madness as she believes herself to be in a relationship with Louis Thanksgiving, a long-dead dredgeman, who appears to her at night. For Ava, it’s a voyage into the Underworld – or is it? – with the Bird Man, whose intentions are unclear, to try to. And for Kiwi it’s his own version of hell – he escapes the island and takes a low paying job at World of Darkness in order to try to clear his family’s debt. 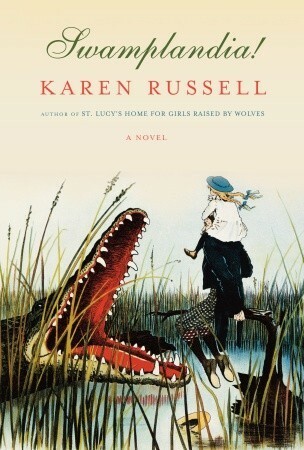 Nominated for several book awards, including the Pulitzer in 2012, Swamplandia! is literary fiction with a slightly ghostly twist – and is unlike anything you’ve ever read.